Magento 2 Restrict Fake Registration helps restricting fake users registration based on specific Email domains, first name, and last name character limits. No more dummy account creations. Restrict registrations based on TLDs. Google reCaptcha to avoid spam account creations. Magento fake customers registration is a growing issue with the advent of spams and bots trying to enter the website. Also, some testers create fake accounts for testing without any intention to convert. In such cases, it is required for admin to take steps towards Magento spam protection and restrict fake account registration. 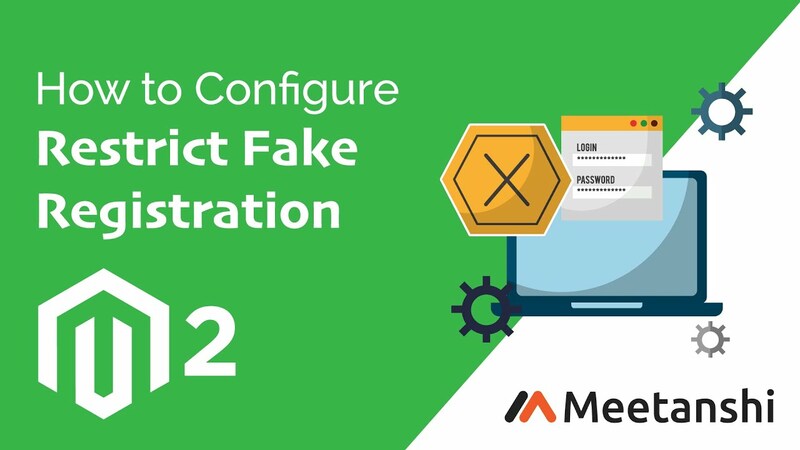 To assist Magento 2 store owners in such a scenario, Meetanshi has come up with Magento 2 Restrict Fake Registration extension that restricts fake customer account creation. The Magento 2 Restrict Fake Registration is your one-stop solution to spammy bots and fake users in Magento 2 store. The module is used to restrict fake account creation by setting restrictions on the Email ID domains (TLDs) used to create the account as well as the number of characters of the name as typically bots use the random large number of characters! The Magento 2 bot stop is a must have module if you are fed up with dummy accounts, spam registrations and bots in the store! It is necessary for admin to secure the store as such fake accounts are a nuisance to handle and just increases the load of the database. Also, the spammy bots may corrupt some functionalities if the store is vulnerable enough to let it enter in the first place. Additionally, the admin can enable Google reCAPTCHA v2 from the backend for security against undefined bots because there should be no possibility left which can compromise the store security! With this Magento 2 bot blocker extension, enjoy a smooth functioning of the store and offer a secure platform to your Magento 2 store visitors! Hence, improve the customer experience of your store and win their trust with secure shopping experience! Admin can set the list of domains to restrict Email IDs used to create accounts. Admin can set validation for the character lengths of the first name and last name used to create an account. Option to enable Google reCAPTCHA v2 for additional security against undefined spams & bots. Secure store for smooth customer experience! No compromise with security of store!